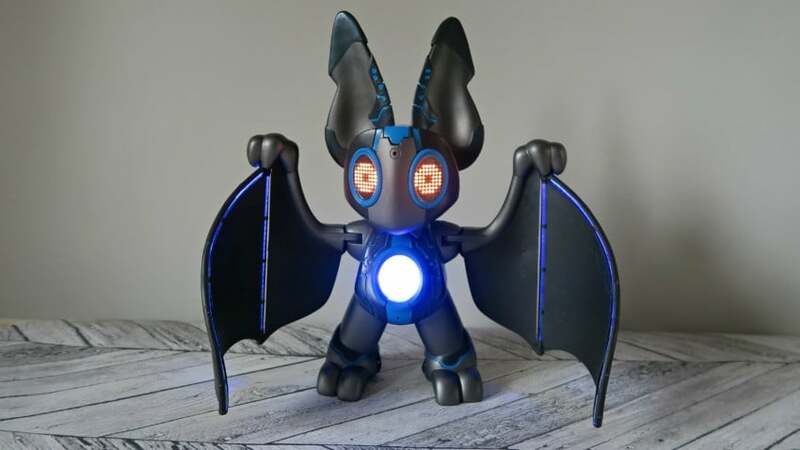 Meet Nocto! He is the latest interactive teenage bat with ‘battitude’, who came to live with us last week, and has made himself known since! Just like my (nearly) teenage son, Nocto likes to hand around, sleep and listen to music, but he is also prone to some interesting mood swings! With 6 different modes to play with, he kept my twin girls entertained for ages. Each mood/mode has an associated light colour, expressions, sounds and movements. I loved this part, as it is really easy for the children to know what mood and mode they had selected on Nocto. As you can see, his moods are very typical of a teenager! 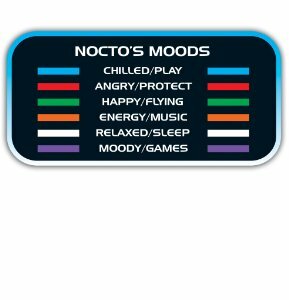 Play mode, is the Nocto interactive mode, where he talks, laughs, and plays. Although you must be careful not to annoy him, otherwise he gets grumpy and yell, then turn red! Game mode, Nocto loves playing games with you, our favourite one is ‘rock, paper, scissors’. He will choose his selection in his eye, then you can scroll through and pick your choice in the other eye. Other games are, ‘Fruit Bat Fruit Machine’, ‘Snap’ and ‘Ask Nocto’, which was the only downside with this toy. Kids being kids ask things like, ‘Do you have ears’ and he answers ‘No’ well, of course, he has ears, their huge! So they start questioning him!! Music mode, we love this mode! 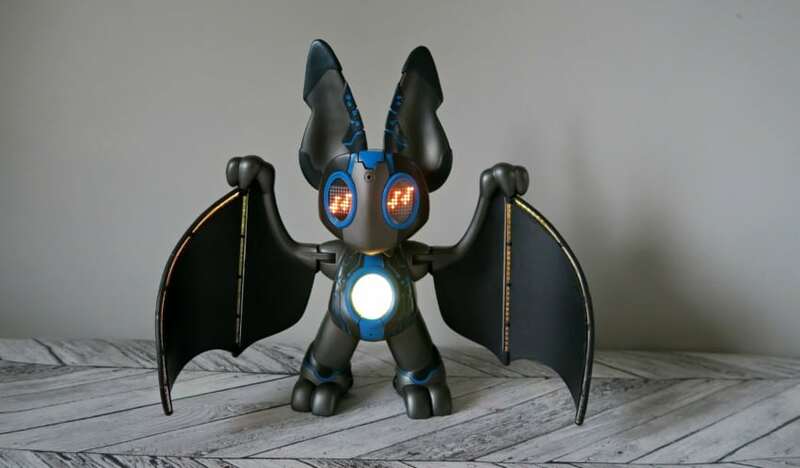 Nocto loves music, set him to the orange mode and he will start his own little dance and playing music! Best bit though is when you play music to him, he will listen to your song and decide if he likes it or not, giving a rating out of 5! My poor daughter sang to Nocto and he gave her a 1!! Good job she loves him!! Sleep mode, you can set him to sleep mode, but boy is Nocto noisy when he sleeps!! You can set him to sleep and hang on his hanger provided, which fits over things like doors and end of the beds. If you keep prodding him though he wakes up! Flying mode, green is flying mode, set him to launch off and he will love flying around the room with you, making his eyes go dizzy! Although he will tell you when he has had enough. Protect mode, this one went down very well. Set him to red protect mode and he will guard and area for you. The girls quickly set him up at their bedroom so their brother couldn’t sneak into their room!! 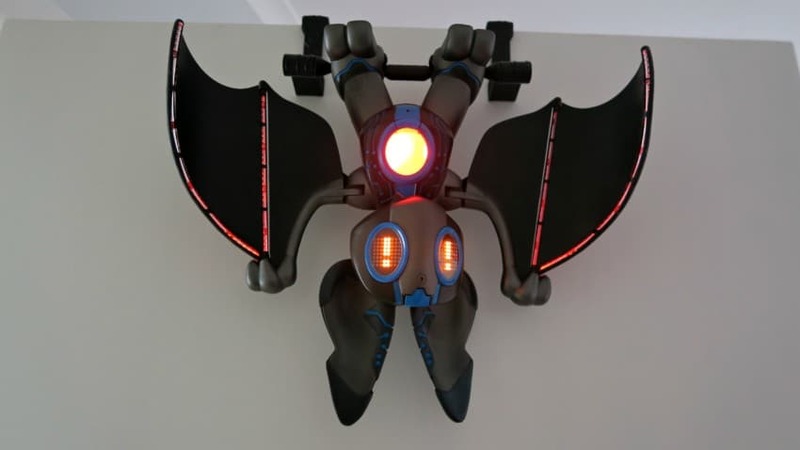 If Nocto sensors and intruder he will sound the alarm and flap his wings! 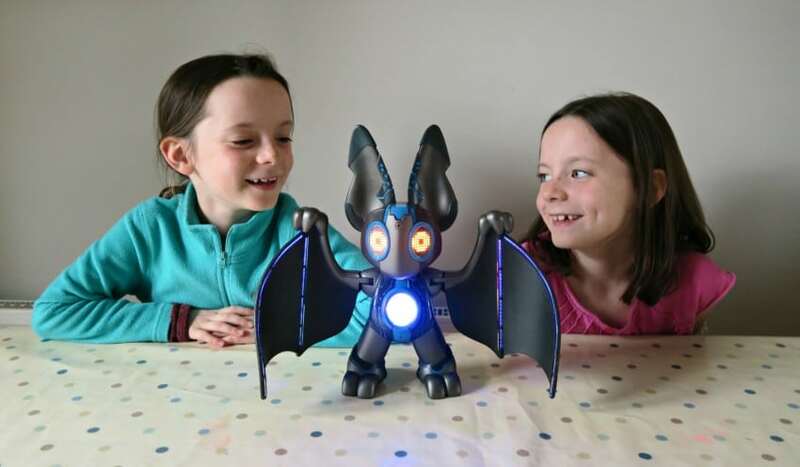 We really like Nocto, he has captured my twin girls attention and they keep picking him up to play with him. Priced at rrp of £49.99 but can be found cheaper on Amazon I think this is a great toy, and I can see him being very popular for Christmas. 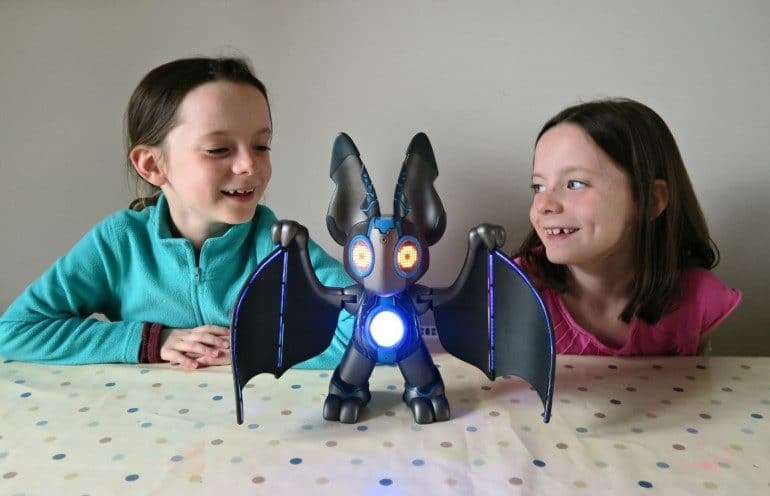 Please take a look at our unboxing and playing video, we have tried to show you lots of bits about Nocto and my girl’s first reaction. So the video is very raw! Another great read thanks to you Steph! I am always amazed at how you are able to write and make your readers feel that they are just talking to a friend. Keep writing please! Oh that is rather fabulous! The kids still love him! This is a pretty amazing toy what it can do. It’s a little creepy though, or is that just me? Ahhh I think he’s cute! Although I like real life bats! Sounds like an amazing toy which will be great as a Christmas gift, as you say. Very reasonable price too, for all he gets to do! What a clever little creatures! The hanger and the sleeping upside down… Would you be able! 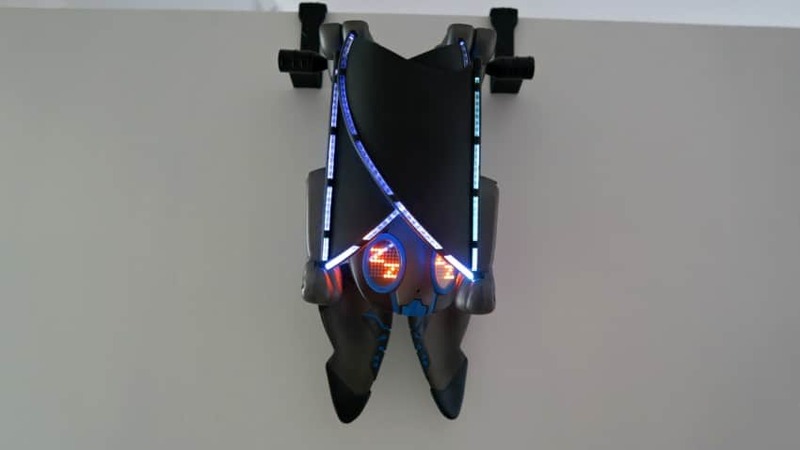 This looks very cool, my daughter would love it! Love that he sleeps upside down! ha this looks brilliant. Really cool toy for this time of year. My kids would love it. Oh my goodness – he’s so cool! I know my Ben would love him. These sort of toys amaze me!! Love that it comes with a hanger for it to sleep!